Strong fundamental literacy skills are essential for students’ success, and third-grade reading proficiency is one of the most important indicators of future academic success as students transition from learning to read, to reading to learn. With the ongoing emphasis on accountability, schools must focus not only on helping struggling students close the gap by grade three, but also must ensure that students considered to be on-target do not fall behind. This balance between prevention and intervention is critical for third grade reading proficiency rates. Many educators focus more on intervention rather than prevention—spending the time chasing the effects of instructional gaps, rather than addressing the root causes. However, an emphasis on effective K–2 reading instruction is a key strategy for reducing the number of struggling students in upper grades. For those K–2 students who struggle with grade-level expectations, the earlier they can be identified, the better. Research shows that if schools wait until grades 3–5 to identify struggling students, the intensity of intervention required to close the gap is significant and seemingly unachievable. Prevention and early identification of skill gaps for all students are crucial (Fielding, Kerr, & Rosier, 2007; Scanlon et al., 2005; Torgesen, 2002). In this whitepaper, we will examine the methodologies for monitoring student progress and targeting skill gaps, and will review the critical elements of high-quality instruction that accelerate skill development for on-level and struggling students. It has been said that the best intervention is prevention. However, many schools often overemphasize Tier II and Tier III students, and do not provide their students who are working on grade-level with targeted instruction to meet skill gaps that arise throughout the year. As a result, those schools may see a spike in Special Education referrals in grades 3 and 4, due to underlying, undetected skill gaps with students who were considered “on-target” in earlier grades. 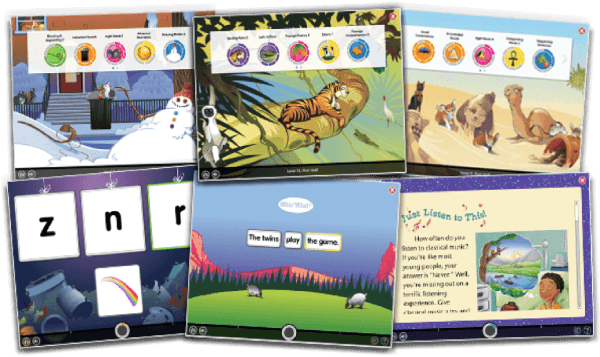 Sometimes students with strong comprehension and sight word vocabulary can appear as though they are reading because they recognize enough of the words or they have essentially memorized the stories. However, when these students enter third and fourth grade, and encounter multi-syllabic words in social studies and science, they struggle with these non-sight words and cannot decode them. Later, as adolescent readers, they may struggle with fluency skills because they have done far less reading than their peers. The Response to Intervention (RTI) and Multi-Tier Systems of Support (MTSS) methodologies have been more widely adopted because they are focused on the concept of identifying students before they begin to significantly struggle. Frequent progress monitoring can help identify skill gaps in students who appear to be good readers, allowing teachers to prevent reading failure by intervening as soon as the student begins to struggle (Justice, 2006). Goals and Objectives – Does the student understand the purpose for learning the skills and how these skills connect with other skills they are learning? Explicit – Are directions clear and straightforward? Do students understand exactly what they are expected to do without having to infer anything? Systematic – Are skills introduced in a logical and specific order, introducing easier skills and moving to more complex? Scaffolding – Is there explicit use of prompts, cues, examples, and opportunities for guided practice? Modeling and Corrective Feedback – Does the teacher model new skills for students and provide corrective feedback as necessary? Instructional Routines – Are the instructional formats consistent from lesson to lesson so that the students can focus on the skill they are learning vs. the format of the lesson? Is the routine consistent so the teachers can focus on their language and their pacing instead of the format of the lesson? Diagnostic assessments, although not used as frequently, can be extremely helpful in completing a student’s profile. When thinking about how diagnostic tests can inform instruction, one main purpose is to provide teachers with additional information that they did not receive from either the screener or progress monitoring tool. They can also be used in scenarios when the progress monitoring tool’s validity or reliability may be in question (e.g. if the child was tired or hungry the day the progress monitoring assessment was given or was especially anxious during the testing). Diagnostic tests can help fine tune instruction and provide more information to understand why a particular student may be struggling. Many schools put solid instruction in place, but fail to monitor student performance frequently enough. Therefore, they do not realize that students are beginning to fall behind. When an end-of-year assessment is the only measurement used to determine student progress, schools risk wasting an entire year for students who display signs of struggle mid-way through the year, and subsequently fail to meet their end-of-year benchmarks. A well-known story of Kennewick, Washington, written by Dr. Lynn Fielding and colleagues (2007), explores how schools can close the gap for struggling students. The book, Annual Growth for All Students, Catch-up Growth for those Who are Behind, focuses on how a district approached the goal of having 90% of their third grade students reading on grade level. They especially targeted students who are two or more years behind grade level, as well as students in grades K–2 who had begun to fall behind. Fielding and colleagues urge schools not to wait until third grade to identify and fix the problems that may exist. Instead, schools must focus on improving instruction in kindergarten, and then first grade and then second grade—addressing the underlying causes of third grade reading struggles. For struggling students, accelerating skill development to reach grade-level expectations requires a very high level of instructional intensity. In Kennewick, for every year students were behind grade level, they would receive an additional 80 minutes of reading instruction per day. For example, if a fifth grader was reading on a third grade reading level, they needed to make up the two years they were behind (third and fourth grade), plus gain the year of growth for their current grade in school (fifth grade). This particular student would receive 80 minutes x 3 for a total of 240 minutes a day of reading instruction. When you consider the significant time intensity required to help students close the gap, it is clear why effective prevention in early grades is essential. Intervention is not accomplished simply by spending more time on the same instructional content. However, if the student does not respond to the initial intervention, switching instructional programs reflexively may not be the right answer, either. There are a number of factors that should be carefully balanced and adjusted in order to provide effective intervention for struggling students whose needs can vary. Matching the program to the student’s needs – Some schools are quick to change programs if the student doesn’t respond to the initial intervention. However, before implementing any kind of intervention strategy, we must first understand the specific needs of that student through progress monitoring and diagnostic assessment. Often times, schools have one or two different programs at Tier II or Tier III, and it is important that teachers understand which skills those programs target, and ensure that it matches the individual needs of the student. Monitoring the effect of the intervention – Frequent progress monitoring is absolutely critical in intervention and RTI and MTSS models. Teachers must ask themselves the question of “did it work” and then carefully note what adjustments were made and what their impact was on student learning. Knowing the different adjustments made and the resulting impact is important for potentially replicating the same approach with other skill areas (and monitoring to see the effectiveness). Some of these adjustments may be as simple as some students responding better to one-on-one instruction rather than small groups, or some students may respond better to small bursts of instruction, rather than lengthy instructional sessions. Supporting teacher effectiveness – Schools must consider the skill level of their teachers and paraprofessionals when delivering intervention. Expecting teachers to create their own curriculum is not realistic given the lack of available resources and knowledge base (Moats, 1994). However, well-designed, scripted reading curricula will not be effective without sufficient training and support. This kind of professional development should focus on helping teachers make thoughtful decisions regarding their classroom and small group instructional strategies (Foorman & Torgeson, 2001), but should also include data coaching so teachers learn how to target instruction effectively. Effective classroom reading instruction can help all but a small percent of students to read and write effectively. This instruction must balance the use of small group and one-on-one settings and vary the intensity of instruction according to each student’s individual needs. Most importantly, teachers must monitor student performance on an ongoing basis so that skill gaps can be identified as they develop, and targeted instruction on individual needs can ensure students maintain grade-level proficiency.